You know I like opening radios up for no apparent reason. This UV-B5 was especially attractive to me - look two rotary encoders with that easily breakable blue plastic! "Just underneath where the rotary knob is the two holes for the flashlight L.E.D. on the UV-B6 model. 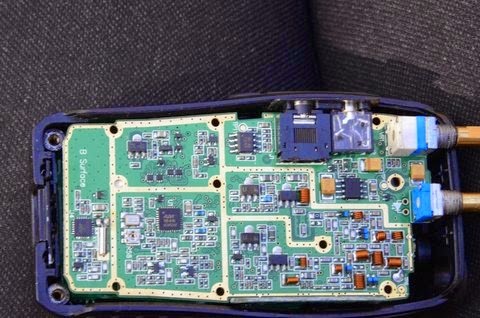 Even though the circuit board is printed UV-B5; I assume that both radio's have the same circuit boards? It also look like the switching transistor for the L.E.D. next to it. I wonder if you put an led in here whether it would light up? If so maybe a backlight mod can be done as the button under the monitor IS wired in circuit (On the B5). I take it that the flashlight on the UV-B6 is either ON or OFF and doesn't flash? if so then this has given me food for thought!" "Just temporarily put an L.E.D. in the holes and it works! So a mod can be done to have a UV-B5 with a flashlight!! All the components ARE already in circuit on the PCB." Now some may ask "Why?" when you could get a UV-B6. To them I say, why not? Also, you could have both a flash light and knob for changing channels. Any electronics scheme for the B5 to re-route it. A mod to have a button to light the LCD independetly ? more handy than a flash light to me.